Hey everyone! Just had to share this. 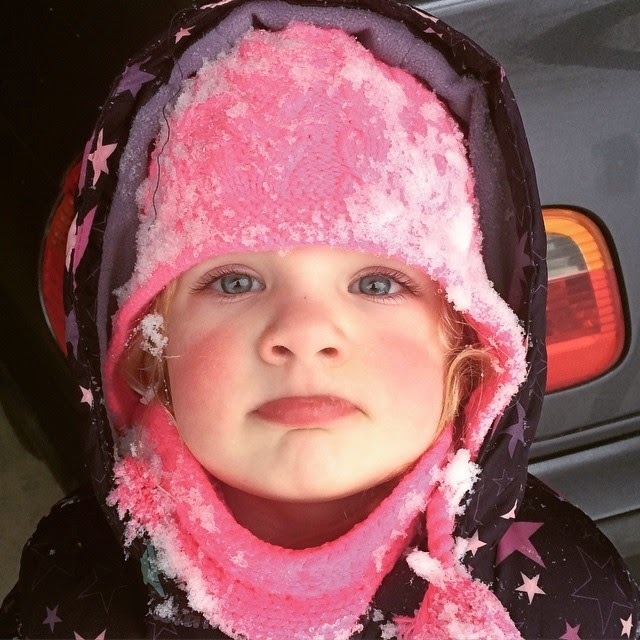 This is the face of someone who LOVES to play in the snow, but is mad because it's SO COLD! Littlest Miss just cracks me up! She only pouts for about 10 seconds, and then she's done, done, done and moving on! To all of my friends and family living in the extremely cold areas, I'm sending you warm thoughts! Hey everyone! No, I haven't been away, nor have I been ill; just busy with life. Several of you were so sweet to check in on me, and I find that so endearing and really touches my heart. I did celebrate another birthday early this month and have definitely reached the age when I feel so fortunate to have actually made it another year.....lol! To be truthful, The Man and I both feel healthier and in much better shape than we were a year or two ago. We also feel extremely lucky and very blessed to be where we are right now. I've been rather hesitant to do a post about Spring weather because so many of you are having such a cold, snowy Winter. I truly feel so sorry for the hardships that the bad weather may be causing and wish you all the best. You can get even with me this summer when we are scorching and you are enjoying the great outdoors, but for now, we are basking in glorious weather with temps in the 70's and 80's! Having doors and windows open has definitely put me in the mood to lighten things up and bring some Spring inside. So today, I thought I'd share some pics of my kitchen. Some of you know that my "word" for the year is MINDFUL, and I have been trying to be mindful in all aspects of my life, including how I decorate. The space above my kitchen cabinets is so much fun to decorate, but I am trying to be "mindful" of how often I have to climb up on a ladder to change that decor. With that in mind, after the Christmas decor came down, I decided to be more selective about what went up there and how to make the space feel right for all seasons. This is a wreath that I purchased in Georgia on our Christmas road trip. I know many of you would say this is a Fall item, but I'm perfectly happy with how this looks propped against my old window where it will stay for quite some time. This big wire basket-thing is difficult to store, so I decided to make it a permanent decor item in this corner. You don't even want to know what it takes to get something into this corner -- rappelling gear comes to mind! I added some moss and natural balls to the bottom basket and some cute glass jars to the top. I love all the colors in this huge platter, too. The only thing that will require a ladder is when the batteries go out in my auto-timer candle, but The Man won't mind taking care of that! These have always been in my dining room and in the sitting room, but the colors really pop here in the kitchen. You may also have noticed that I left space between items. For the longest time I felt compelled to fill every gap with something -- either another decor piece or foliage. Not anymore! I'm telling ya' that foliage gets really dusty and is not easy to clean, plus it looked messy. I like having some blank space to rest the eyes. I even changed up a few things in my dish cabinet. For the longest time, I have had this filled with all of my Fiesta Ware. I kind of have two seasons of these dishes according to color.....Fall/Winter and Spring/Summer. I usually just kept them divided on two separate shelves, but after purchasing some pretty serving bowls from World Market, I decided to remove the Fall/Winter Fiesta to another cabinet. I love it so much more now -- just looks so much more interesting to me. I like the cake stand with some cups on it, too! The doors are clear glass, which is why I had them open for the photos. Some of you may remember my pompom wreath from my Fall kitchen decor, and even then I knew I wanted to bring it back out after the holidays. I decided to beef it up a bit with more pompoms, and I could not be happier. Seriously, pompoms are so much fun to make! Okay, yes, I've already brought out some Eastery things! I love the color of the eggs in the apothecary jar, and I also really like that this centerpiece is simple and easily contained in this galvanized tray for easy removal for a meal. I cannot even remember how old this bunny planter is, but I remember finding it at Big Lots many, many years ago. I just have a jar inside holding the cut flowers. The heavy metal candle holder use to be dark brown until I hit it with FolkArt Home Decor Chalk paint in Yellow Crochet. I sanded just a few spots to let some of the dark show through. Until I find a preserved Boxwood wreath that is affordable (yeah, not likely to happen), my little faux one will have to do. This is on the support post at my kitchen window. I've had this little bunny forever! Lastly, this little shelf which is located across the hall from my craft room and just around the corner from my kitchen, is always fun to decorate seasonally. I have a chalkboard just below the shelf but haven't decided what to write on it yet, so stay tuned. I am such a fantastic chalk artist ( believe that and I also have a bridge for ya') that you really won't want to miss it....I'll keep you posted! Well, it is so much fun to have a post to share again. I am very happy that you stopped by and hope you will come again soon! Hey everyone! I just wanted to squeeze in a short little post before The Super Bowl gets into full swing. I never do much in the way of Valentine decorating and probably even less this year, but thought I'd share the little bit that I did do. My craft-sewing room really doesn't need any added color or fun-stuff to make it my absolute favorite room in the house, but it got just a bit of "Valentine Love," anyway. See what I mean? Quite a colorful and happy little room! If you've been following my blog, you will notice that I have, once again rearranged some things, but I won't torture you with all that. There's some Valentine love going on! I've had this little wired stem thingy forever, but it was brown. I just did a little hit or miss with some white chalk paint & popped it into a little mason jar. Threaded them onto some white twine to make this little "swag of love!" As long as this was in the pic, I'll share what my plans are for this Smash book. The little tag at the top says "All About Fabric." I have several sewing projects I want to complete this year, and this book will contain any measurements & info I need to finish existing projects and plans and ideas for ones that are still floating around in my head. I've had these little red hearts for a few years & wasn't sure what I wanted to do with them, so for now, they are hanging out on the end of my thread holder -- I kind of like them right there! And chalkboard. I almost always do something seasonal here. I made the little cloth hearts a couple of years ago. I really love turquoise combined with red. So there you have it. My itty bitty Valentine touches for 2015! Now I'm off to watch the game. Go PATRIOTS! Seriously, it's only because Tom Brady is just so super-cute!